It's not often a world-famous photographer will put down their DSLR to champion a camera phone but that's exactly what's happened with the Google Pixel 3 - a phone with a camera supposedly so good, Annie Leibovitz has been taking portrait shots with it up and down the country. 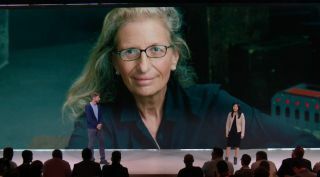 At a big Made With Google event in New York, it was revealed that Annie Leibowitz has partnered up with Google to use the Google Pixel 3 camera to take photos around the US. And just in case you are thinking this is the sort of product push she does on a regular basis - it's the first time Leibovitz has partnered with a phone company. At the event, it was revealed that Leibovitz “travels around the country, capturing portraits of inspiring people and places” with the new handset. Leibovitz, who features in our 50 best photographers list, did prefer to shoot on an iPhone (according to The Verge) but the latest Google camera phone has made her switch and, we're presuming, there might be a bit of money in the sponsorship deal as well. Saying that, no photographer would put their name against something unless they believed in the quality of the kit. The Google Pixel 3 is perhaps on the most surprising recent camera phone launches as it only has one rear lens. The recent trend to favour two or even three lenses, as seen on the iPhone XS and Huawei P20 Pro has meant that multiple lenses is now the norm. Google is relying on some pretty powerful software smarts - including improved bokeh, nighttime shooting without flash and super zoom functionality - and famous photographer endorsement to make sure that its phone is the best camera phone around. The best camera in 2019: which one should you buy?